The Bunbury Banter Theatre Company works as a collective of theatre professionals and we would not be able to stage our theatre productions, run the many educational programs and air our audio plays, without the kind assistance from many different people. We are extremely grateful for all the wonderful support we have received over the years and for the support we continue to receive from a number of different directions; be that through financial donations, advice and guidance, discounted or free services and space hire, associations and general support for our aims and ethos. Drama and access to the arts is essential but when everyone is feeling the pinch and as the economic crisis seems set to linger on, some of our parents and students are really struggling to fund their participation in our drama classes, workshops and educational programs. So in response to this situation, we have set up Bunbanter’s Creative and Associate Angels scheme which is designed to encourage local businesses and companies to pledge their support (financial or other) and ensure that drama is still offered in their local community, even to the most deprived. Bunbury Banter Theatre Company is a Community Interest Company and so our first and foremost concern is continuing to offer everyone access to drama regardless of financial constraints. To do this we will continue to offer as many scholarships and discounted places as is possible and currently over 70% of our students receive some assistance in this way. In addition to this, we often work for free and the company has regularly volunteered our services to local schools and organisations alike but this is not a long term solution and we cannot ask the many brilliant theatre professionals who work with us to also volunteer; especially since they too are battling with the recent cuts to the Arts. Each geographical area in need has its own group of Creative Angels who work together with us and our Associate Angels to help provide drama opportunities, workshops and classes in their area, accessible to all. This group of ‘Angels’ is made up of similar but complementing (ie; no two the same) local businesses, who each donate a small amount; small enough to be un-noticed by them but together with the others proves big enough to provide us with a net of sponsorship, enabling us to fully pay our teachers, provide equipment and ensure the on-going and smooth running of the classes when we often, might not have been previously able to do so. As well as their invaluable contribution to the lives of many local children and families, our ‘Creative Angels’ also enjoy further benefits from us, such as a press release and local press campaign, link/logo placement and marketing distribution through relevant Bunbanter projects plus assistance in forging links with both the local school/organisation we are working with and the other Angels involved in the group. In addition to all that, every Angel also receives a ‘Creative Angels’ badge to display on their website and present in person for exclusive offers from our ‘Associate Angels’. *It is important that the group works over a yearly period to ensure the students have consistency and time is given to fully generate local links and working relationships. Becoming a Creative Angel will not only have a positive effect on people in your area, bring a new level of trust and community to your door but also improve the reach and reputation of your business. Other possible benefits are also being discussed and we welcome any thoughts and suggestions by all interested or involved parties. 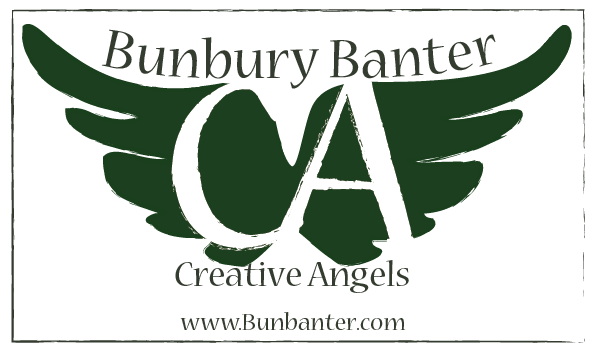 To become a Creative Angel, either through a business/organisation or personally, please email us on – info@bunbanter.com – We look forward to hearing from you! Can’t give money but still want to help? ‘Creative Angels’ – help us by helping them! Thank you so much for all of your help, wisdom, and support. Alan Bennett, Harriet Walter, Zoe Wanamaker, Nichola McAuliffe, Jane Asher, Sir Peter Hall, Stephen Unwin, Timothy West, Prunella Scales, Sutish Shama, Jayne Dickinson, Peter Craze and everyone at Drama Studio London, Caroline at The New Inn, Ealing, Ranj Rasul, Jenny Wilson, Charles Douthwaite, Andrew Barns-Graham, Dirk Maggs, Jenny Gibbs, Charles Hammond and John Mayfield… To name but a few. …you cannot underestimate the value of keeping wonder alive. Wonder keeps our spirits joyous and resilient. The Bunbury Banter Theatre Company can only make relevant, powerful and essential creative work with the support of many individuals, businesses and organisations, often in the form of funding and sponsorship. With the recent cuts, our educational work also needs extra investment and we’re not alone! If you can, please take a moment, to watch the video as the following information sums up why continuation of public and private investment in the arts is not only important, but downright vital! We have extremely attractive sponsorship packages available to corporations, companies and individuals for both our educational and creative work. Please get in contact with Phil (our company producer) on 07738 839 295 or phil@bunbanter.com for more information.